The film is a unique experience, the culmination of all the current cinema technology coming together to create a new visionary sensation on screen. Time and place are absolutely created, providing a sense of awe that probably has equivalents in the first Edison movies, the advent of talkies, widescreen, “2001, A Space Odyssey,” “Star Wars” and any breakthrough that alters the perception of what is possible to experience on a movie screen. Coupled with this is a tale of survival that pits the puny dot of a human against the hostile, airless environment. In that fight all possibilities are realized, and the will to live becomes the prime factor in defining what life means. 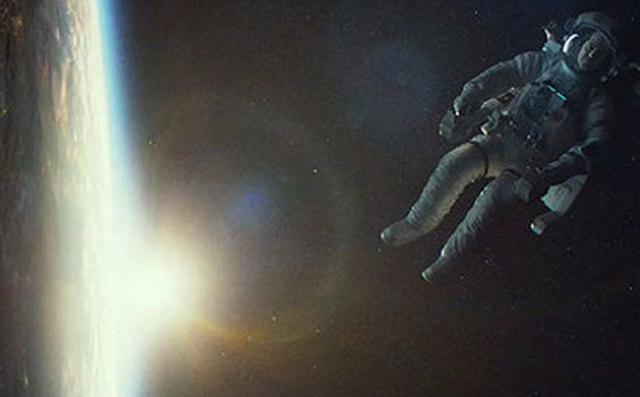 The film opens on a shuttle mission depicting space walking astronauts fixing a space telescope. One of the mission specialists doing software adjustments is Ryan Stone (Sandra Bullock). Floating untethered on a jet pack nearby is the commander of the shuttle, Matt Kowalski (George Clooney). Stone is a civilian who trained to be on the shuttle, Kowalski a veteran astronaut making his last flight. A message from mission control (voice of Ed Harris) informs the crew that a field of space debris is heading their way, and they must abort their space walking. The communications suddenly black out, and the debris field hits them almost simultaneously. The wreckage of the shuttle is devastating, with Kowalski and Stone trapped in their spacesuits, pursuing a new way to get home. And what a “home” it is – the earth is a marvelous blue ball hanging in the darkness of the sea of space. The audience beholds the same visual revelations as the astronauts, and it is an amazing sensory awareness. With all of our real life difficulties and fears, the movies again offer an escape valve to another consequence. This film represents another step toward an enveloping interaction, where it will be even ten years from now is beyond comprehension, probably even with the visual creators in and ever-changing technology. But what would this film without an absorbing and intense story to back it up? A great movie can be viewed on a 10-inch window on a computer and still have an impact. This is one of those films, although it’s not recommended to be viewed only in that way – the 3D is spectacular and there is also an IMAX option. But the story does hold up to a scrutiny of reducing the visuals, and in the future graduate film papers will be written regarding the symbolism of the journey and the various vehicles used to get there. Visuals without a story sometimes works, but in this case the familiarity of astronauts and the shuttle becomes a literate narrative surrounding the grandeur of the earth’s edge. 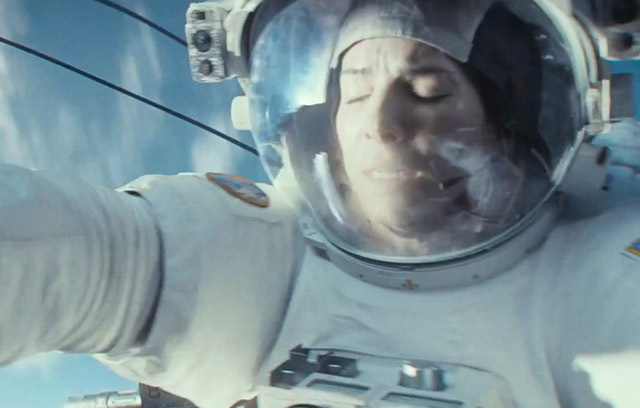 Sandra Bullock is the prime motivator as the reluctant astronaut. Her character is the most put upon, must make the most right decisions and inevitably must understand her inner psyche to steer her human craft. She handles it definitively, mostly relying on the character instincts written into the script. She is at a perfect time in her career to tackle the role, she embraces the character and inevitably handles all the inner demons that are extracted in flight. She may be in for another best actress nomination. There was only one minor infraction. It might have been a good idea – as was done in “2001, A Space Odyssey” – to use unknown actors in congress with the visual landscape. The recognizable spirits of “movie stars” Clooney and Bullock may have a tendency to separate the attention span from the story. It neither harms nor steals from anything presented, it’s just an observation. Submitted by Mr. Leland on October 8, 2013 - 11:39am. The planets must be in alignment.